If you are sewing knits and want a professional looking hem, then consider learning how to sew with a twin needle. Twin needles can also be called double needles and are simply 2 needles joined together with one shank at the top. Once you are confident sewing knits and getting great results, it will open up a whole new world! Twin needles are also used for pin tucking and other decorative purposes in woven fabrics. Look at most of the t-shirts in your cupboard and you will notice 2 neat, parallel rows of stitching on the bottom hem and sleeves. You can also use a twin needle for finishing the elastic in the legs or neck when sewing leotards. Nearly all modern, domestic sewing machines can sew with a twin needle so you don’t need a fancy machine to get these professional looking hems. So are you ready to start learning how to make a beautiful twin needle hem? What is a twin needle used for? A twin needle or double needle is used to produce two rows of parallel stitches on top with zig-zag looking interlocked stitches underneath. In woven fabrics, it is purely decorative but in stretch fabrics, it creates an attractive hem that will not break when stretched. Scrap fabric or your project to hem. Twin needle – Popular brands include Schmetz, Birch and Singer. Your zig-zag machine foot. The opening in a regular foot is generally not wide enough to accommodate both needles. 2 reels of thread for the top of the machine. Regular bobbin – you will only need the one bobbin. Your regular machine. As long as your machine can do a straight stitch, and you have a foot with a wide enough opening, you can use a twin needle. Twin needles or double needles are available for most makes of machines and have 2 needles attached to the one shank. Shank thickness – Common thicknesses include 75/11, 80/12, 90/14 and100/16. The smaller the numbers, the thinner the needle and the lighter the fabric you will sew with it. Their purpose – This is the type of fabric designed to be sewn by the needle and includes jersey, universal, ballpoint and embroidery. Distance – This is the distance in millimeters between the points of the 2 needles – These include 1.6mm, 2mm, 3mm and 4mm. When deciding on which distance to choose, double check that the distance between the 2 points of the needle will fit into your machine foot. You don’t want it to touch the edges and break. All these add up to a lot of combinations! If your local shop only has a limited choice, prioritize purpose and then thickness. See how one needle is ever so slightly shorter than the other? This is normal and helps create the interlocked stitches on the underside. Hopefully your manual should give you some instructions on how to thread a twin needle but if it doesn’t, then try these tips below. Step 1: Put the shank of the double needle into your machine. Make sure it faces the correct direction with the flat part of the shank facing towards the back. Step 2: Don’t forget to put your zig-zag foot on your machine as it will have a wider slot in which the needles can fit. Step 3: Thread your bobbin as per usual. Step 4: Thread your machine as per normal and thread through the left needle. Step 5: Thread the second reel of thread through the machine as normal and into the right needle. Most machines will have somewhere to place this second reel of thread. If yours doesn’t then improvise! You could use the bobbin winder or even a wooden stick taped to the side of your machine. If you are using a twin needle regularly it may be wise to purchase a spool holder which you can place by the side of your machine. If you don’t have 2 reels of thread in the same color, then just wind a spare bobbin and use that for the second reel. Step 6: You are now ready to start sewing. Now, this is a little different to usual. Normally you would sew a hem on the wrong side of the garment. This time you will be sewing on the right side. Pin under your hem and use your fingers to feel the edge as you sew. Your stitches should be near the edge without going over it. IMPORTANT: Use the hand-wheel for the first couple of stitches just to double check the needles are not going to hit the side of the foot and snap. You will generally use a straight stitch to sew hems but you could also consider using a zig-zag or other decorative stitch. See the video below (8 seconds) to see a twin needle at work. Once it is all threaded it really is like sewing any other hem. TIP: If you are sewing stretch fabric hems, then use some double sided hemming tape first to stop the hem puckering. Read how to hem stretch fabric. See how the top has 2 rows of stitching on the underside looks like a zig-zag. This gives your hem built-in elasticity so the stitches won’t break easily when stretched. 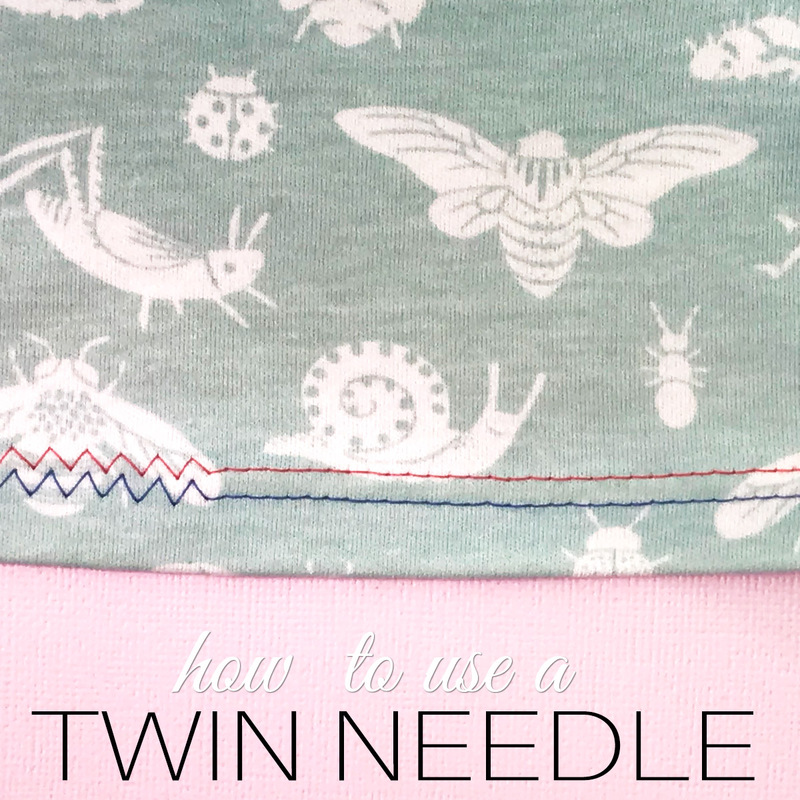 If you have any extra tips for using a twin needle please leave your comments below. tape helps with that as well? I tried it once, but didn’t want to mess with the “pucker” issue and just quit…..